Looking for a new bed online? With so many mattresses and mattress brands to choose from, it can seem like a difficult task. Which brand is the best? What makes one brand better than another? You’re probably already familiar with big brand names, but what about online bed-in-a-box brands such as Loom & Leaf? Before buying, it’s important to consider your own sleep needs and to take time researching the ins and outs of the mattress of your choice. In this article, we’ll discuss Loom & Leaf mattress reviews to help you decide if it’s the best mattress for you. Below, we’ll dive into the materials used to make the Loom & Leaf mattress, who the L&L mattress is good for, as well as the sleep trial and warranty information for this bed. Loom and Leaf is a subsidiary of the well-established Saatva company— who also manufactures the Zenhaven latex and Saatva hybrid mattresses. Saatva was founded in 2011 and has quickly become one of the largest online-only luxury mattress companies out there. Saatva recently made Forbes’ list of Top 100 Best Performing Companies. In 2015, they launched their Loom & Leaf brand. Loom and Leaf carries one mattress, their exclusive all-foam L&L mattress. When Saatva opened Loom and Leaf, their mission was to provide people a luxury mattress without the cost, drama, or hassle of shopping in-store. Saatva sells their L&L bed exclusively online, meaning you won’t be able to find this mattress at your local furniture retailer. Because their beds aren’t at other stores to try before buying, Loom and Leaf offers its customers a risk-free sleep trial when they buy the L&L online. The all-foam L&L mattress is made from a combination of memory foam and poly-foam. Overall, this bed has three main layers: the cooling layer made with L&L’s proprietary Spinal Zone Gel, the transitionary memory foam layer, and the durable support foam layer. Saatva sources all of their materials for the L&L right here in the US, and handcrafts each bed in California. Top Cover: The cover of the Loom and Leaf mattress is made with organic cotton, a thin layer of foam, and natural thistle. The layer of foam integrated into this cover provides extra pressure relief when first lying down on the mattress. Additionally, the natural thistle used in this cover acts as a natural flame retardant, eliminating the need to use harsh chemicals in their cover. Spinal Zone Gel: Underneath the cover is a 2’’ layer of gel-infused memory foam. This layer is slow to respond to pressure, so it should contour to your body and provide a cradling feel. The foam in this layer has an inverted design to promote airflow through the bed, preventing you from waking up hot. The proprietary Spinal Zone Gel integrated into the foam works in conjunction with the foam’s inverted design to keep you cool while you sleep. Another perk to infusing gel in memory foam is it is thought to increase the firmness of the foam. Using gel foam in the areas your body needs more support, such as your feet, hips, back, and head, is a way to create targeted support in the surface of the bed. L&L infuses their Spinal Zone Gel into the lumbar region of their mattress in the hopes of improving lumbar support. 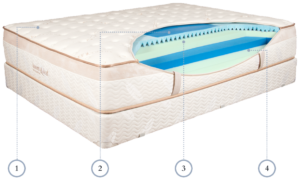 Memory Foam: The second layer of the L&L is 2.5 inches of memory foam. The foam in this layer has been designed to contour to your body’s shape and provide both comfort and support for the sleeper. Because a common complaint with memory foam is it can sleep hot, L&L puts their cooling gel-infused foam first before their layer of memory foam below. Transition Layer: Below the layer of memory foam is a 2-inch transition layer of poly-foam. The function of the transition layer is to add a bit of cushion between the comfort layer above and supportive core below. By including a transition layer in the design of this mattress, L&L is reducing your chances of sinking into the bed and bottoming out on the durable core. A transition layer also improves weight distribution through the mattress, ideal for heavier sleepers and couples. Supportive Core: Standing tall at 5.5 inches, this high-density poly-foam offers the bed structural support, improves the edge support, and should prolong the lifespan of the mattress. When buying the Loom and Leaf mattress, you can choose between Relaxed Firm or Firm for the firmness of your mattress. When looking at customer reviews of this mattress, it appears most customers are describing their bed around a 6 or 7 on the firmness scale to 10. Typically, back and stomach sleepers sleep better on firm mattresses because they provide the support to keep your spine straight while you sleep. If you’re a stomach sleeper specifically, you should avoid softer beds because they can cause your torso to sink unnaturally, creating an uncomfortable curve in your spine. As a side sleeper, a relaxed firm may be better for you because it will allow your curves to sink into the mattress more to relieve pressure points. Ideally, side sleepers should look for a medium or soft mattress. However, reviews of the L&L note it is comfortable for back, stomach, and side sleepers. For back and stomach sleepers, you should feel a bit of sink in the bed as it relieves pressure and tension. For side sleepers, this bed may feel uncomfortable upon initially laying down, but reviews note the pressure you initially feel in your shoulders and hips quickly goes away and this bed becomes comfortable. A Queen Loom & Leaf costs $1,299 and comes with free White Glove Delivery and removal of your old mattress. 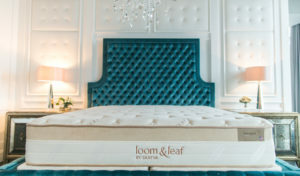 Loom & Leaf regularly runs mattress sales, so keep an eye on their site to find the best deal. When you buy a Loom and Leaf mattress online, it comes with a 120-night sleep trial. The sleep trial allows you to test the mattress in your own home for a few months to gauge whether or not the bed is the most comfortable option for you. If you decide against keeping it, they’ll ask you to send it back; the transportation fee to return the mattress is $99. In addition to the sleep trial, the L&L bed also comes with a 15-year warranty. Within the first two years of your warranty, Saavta will replace a defective L&L mattress at no cost to you. After two years, Saavta will repair and recover your defective mattress but this requires you to send the mattress back to them; to send it back, you’ll be incurring a $99 transportation fee. Saavta also offers a “Fairness Replacement Option” because they’ve found submitting warranty claims can cause conflict and arguments between the brand and customers when determining actual defects in the mattress. If you decide to go this route after your mattress has been deemed defective, you get to keep your original mattress and Saatva will deliver and install a new L&L mattress at a prorated price. Between years 3 and 5, L&L will deliver and install a new mattress for you at 70% off of the original price. Between years 6 and 10, they will issue a replacement at half off. After year 10, L&L will issue you a replacement at a 25% discount. If you opt into the Fairness Replacement Option program, there are no fees associated with the delivery or set-up of your new mattress, and you avoid incurring the $99 transportation fee that comes with sending your mattress back. If you’re in the market for a firmer all-foam mattress, the L&L is a great option— it comes with a generous sleep trial to test it out and is backed for 15 years by its warranty. When reading reviews for this mattress, we noticed a few trends. First, we read the L&L isolates motion well and is virtually silent while doing so; if you share the bed with someone who tosses and turns, this bed shouldn’t transfer their motion. Reviews also noted customers don’t feel stuck in their mattress while sleeping on the L&L. Instead, they can change sleeping positions and get in and out of the bed easily. Another common trend amongst customer reviews was the mention of pain relief. It seems since customers have switched to their Loom & Leaf, they’re experiencing fewer aches, pains, and pressure points. Negative reviews of this bed mention it tends to trap heat within and has poor edge support. Because this bed combines multiple layers of memory foam, there is an increased risk of experiencing off-gassing with the Loom and Leaf. We hope our guide has helped you weigh the pros and cons of buying a Loom and Leaf bed. If you’re still undecided, we encourage you to check out L&L customer feedback and our other mattress reviews to find your best bed.